It’s now 2018 and one trend I clearly see in the home construction business is that home builders are building smaller homes. Not because they want to, but instead, because that’s what today’s home buyers can only afford and want. Yes, large McMansions are still being built for the wealthy few, but for middle class America, or what’s left of it, is opting for the smaller home out of necessity and interest. I’ve come to two conclusions on why this is so. First, today’s average homebuyer can only afford to buy a small home due to national and personal declining economic conditions. A shrinking U.S. economy and increased regulation on home building and everything related to it, including energy and water use, have led to a real loss in buying power for the average middle class American. For the past six years the United States economy has been in real decline. Yes, the stock market has risen to record highs, but only because the Fed has continued to print cash and spend money at astronomical rates. The average worker on the other hand has seen zero wage growth during the same time period. In regards to regulation on the home building industry, the government mandates everything from the VOC levels in paint, to the use of high energy efficient appliances, to mandates on what type of building materials can be used in new home construction. As a result, the average cost per square foot of a home has gone up dramatically in recent years. The second major reason for the trend in smaller single family home construction is that the average American person has his or her head lost in technology. The next time you are in a public place take a good look around you. You’ll observe that more than half the people standing or sitting around you will have their eyes focused on a smart phone, tablet or computer resting in their hands. The same behavior exists when they are home, but to an even greater extent. Simply put, the average American is so focused on their personal technology that they could care less about the world immediately around them, including the place they sleep in. They call it the “Internet of Things”, or IOT. Sadly, IOT is physically consuming the average person. In effect, IOT is the Terminator and has already consumed Sarah and John Conner, your average American citizen. To conclude, the trend in smaller single family home construction will not only accelerate, but will most likely morph into what we have seen in countries like China and Russia, state owned public housing. Housing where the government assigns a person or family an apartment, and provides them with some basic used furniture to call home. If I were a home builder today, I’d seriously begin to build relationships with the politicians so that I’d be first in line to win the contracts on the future state owned apartment complexes. 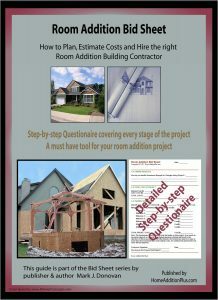 For help on building a room addition, see HomeAdditionPlus.com’s Room Addition Bid Sheet.The Room Addition Bid Sheet provides you with the knowledge and information on how to plan a room addition project, and what to look for when hiring contractors. It also includes a detailed cost breakdown table and a spreadsheet for estimating your own new solarium or glass sunroom addition building costs.